The use of wood in stair building is an age old tradition that has stood the test of time. Every stair project that Nevada Stairs installs, is meticulously sanded before the application of the stain and top coat. Although we try to select each piece of wood for perfection, there will be natural markings and color variations that is part of the beauty of real wood. Depending on the stain color that is selected, it will either bring out the wood variations or help hide the wood variations. Lighter stains have a tendancy to bring out the variations, while the darker stain colors will hide them. Hardwood generally comes from a deciduous tree that loses its leaves annually, and it is widely considered to be the highest quality of wood. It tends to be slower growing than softwood, and therefore it is usually denser, harder and more expensive. 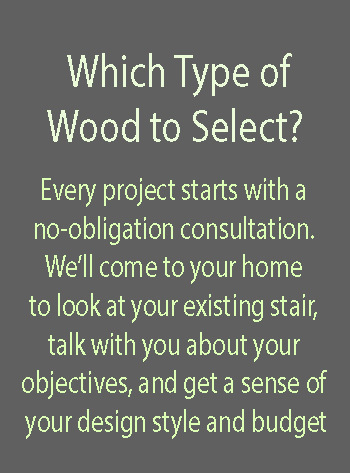 When well treated, beautifully worked and hand crafted, hardwood is the perfect choice for your home. Not only will it last for years, but it brings a real quality and class to your home. For hundreds of years cherry has a been a desirable wood species due to its beautiful natural color; it’s subtle grain lends itself to elegant applications. Cherry is an excellent wood for furniture, cabinets and stairs. Walnut is strong, hard and durable, without being excessively heavy. A rich hardwood with an even but coarse texture; the grain is usually straight, but it can also be wavy. With hues ranging from light brown to nearly black it polishes to a lovely finish. Maple is so hard and resistant to shocks. Maple has natural beauty with a smooth surface due to its closed grain properties of the wood. The hardness of maple makes it a great choice for stairs and any place that gets a lot of abuse from heavy use. Mahogany is strong, with a uniform pore structure and poorly defined annual rings. It has a reddish – brown color and may display stripe, ribbon, broken stripe, rope, ripple, mottle, fiddleback or blister figures. Mahogany is an excellent carving wood and finishes well. Poplar is a species of wood that is commonly used in woodworking. It is a creamy white-colored wood with brown or gray sections or streaks through the grain. It’s considered a hardwood by species, but this can be somewhat confusing as it is typically softer than pine, a common softwood. White Oak, an American hardwood, ranges in color from a very light color to a light to dark brown heartwood. A straight-grained hardwood with a medium to coarse texture. It stains and polishes well, and can also be limed to bring out the grain even further. Beech is a heavy, pale -colored, medium-to-hard wood. It is a fine, tight grain and has large medullar rays. Beech is similar in appearance to maple and birch. One excellent characteristic of Beech is that fact that it does stain and polish extremely well for a classic look and feel. Yellow birch has a white sapwood and light reddish brown heartwood. The wood is generally straight-grained with a fine uniform texture. Generally characterized by a plain and often curly or wavy pattern.There are many species of birch. The yellow birch is the most commercially important.